Del lat. retractāre 'retocar, revisar', 'corregir'. 1. tr. Copiar, dibujar o fotografiar la figura de una persona o de una cosa. 2. tr. Hacer la descripción de la figura o del carácter de una persona. U. t. c. prnl. 3. tr. imitar (‖ parecerse). 4. tr. Describir con exacta fidelidad algo. 5. tr. retractar. U. t. c. prnl. These days of shifting one minute from reading Jorge Luís Borges (in Spanish) to Emily Dickinson (in English) the difference between these languages is in my thoughts all the time. As an example of how a language will approach the same thing in a different way take the word portrait and its equivalent in Spanish retrato. A hint to the meaning of the word in Spanish might illuminate those who speak English in the similarity between retrato and retract. Thus in Spanish, according to my excellent on line dictionary RAE (Real Academia Española) a retrato has as its root origin from the Latin the word retractare which means revise, retouch, correct! Did the Romans suspect that a likeness of a person could never be accurate? As a semi-hippie high school teacher in the early 70s I often told my students of an experiment involving my idea of very early computers. A young woman would place in a room a camera on a tripod with a light on one side. Nothing would then be moved and she would stand on one spot without movement. Then, one at a time, her father, her brother, her mother, her sister, the plumber, her best friend, her boyfriend, her physics teacher, would each snap the shutter once. I believe that the resulting portraits if studied carefully would reveal the intention of each snapper, with the reaction of the woman snapped. We might be able to guess who took which photograph. And my further idea was that if we fed all the photographs into a super computer that we would instruct to combine all images into one, we would then approach an almost totality of the person, perhaps a Platonic Essence. In my many years (1963-2016) with a darkroom I went through many shifts in style, particularly when I printed my negatives. I first thought high contrast was best for impact. Then I swung in the opposite direction and opted for getting all those shades of gray and detail in the near blacks. And these prints I sometimes printed dark and at other times not so much. With my b+w negatives I went in the same two directions but in the end settled with as many continuous tones I could muster and avoided extreme contrast. What this means to the average person examining a photograph printed by a photographer is that you will mostly never see two the same unless the photographer happens to have printed them one after the other on the same day. The intentions of a photographer at one time would have been more evident in the examination of a 35mm slide or a bigger one (called a transparency). Then the only variation of that unique (original to stress the word) image would be in its reproduction as a printed image. With my darkroom now history in our new Kitsilano duplex I find myself doing the very same that I did before which is to re-interpret myself. This time the tool is the scanner combined with Photoshop. I have a very old Photoshop but it has that invaluable tool called Shadow/Highlight. If I play with it particularly in RGB (not in LAB where there is little if any colour variation) the results can be most interesting. Some time ago I wrote here about Mónica Salvatella. I illustrated the blog with an interpretation I have varied here. I am pleasantly surprised with the possibilities. You can be almost sure that any person who might be listening to a Blue Note jazz recording is at least over 60. You can make such blanket statements with enough accuracy but you must also expect the fact that humans can be unpredictable. No matter how good your statistics probabilities do not guarantee possibilities. As a photographer over 60 (in fact I will be 74 shortly) I am well-versed in what used to be the only way to take photographs which was to use the stuff that involved emulsion on flexible and transparent plastic – film being the short word. The almost complete transition from film to digital has pushed film stuff into a background that will soon be oblivion. A byproduct of all that, has really hit the film (as in movies) industry. Special effects have to be beyond wow to wow us. At one time (and I can remember it very well) we marveled at a typewriter working without human hands. Did anybody ever see Naked Lunch (1991)? That, brings me to the three found images in an envelope in my garage (now studio) attic. 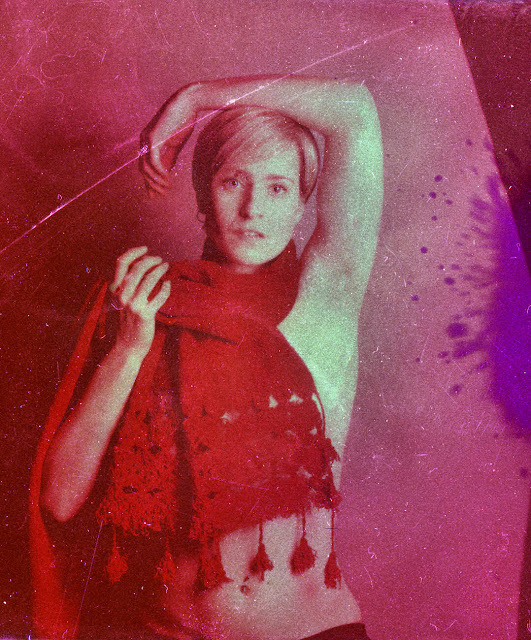 One is Fuji Instant Colour Film peel to which I bleached the black backing and then reversed after scanning. 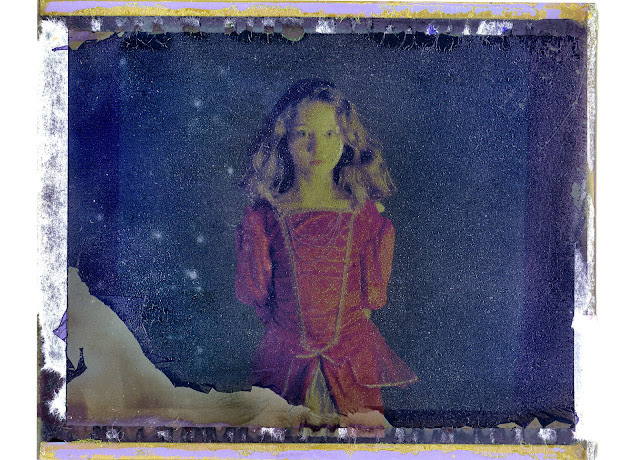 Another is the image on a Polaroid Colour peel (Polaroid peels did not fade as Fuji ones do. The third, the one in b+w (but which I colorized and is the first image in the blog) is a combination of a reversed and an unreversed b+w Fuji Instant b+w peel. By peel I mean what we stupid photographers (at least this one) used to throw away not being aware of their special effects potential. 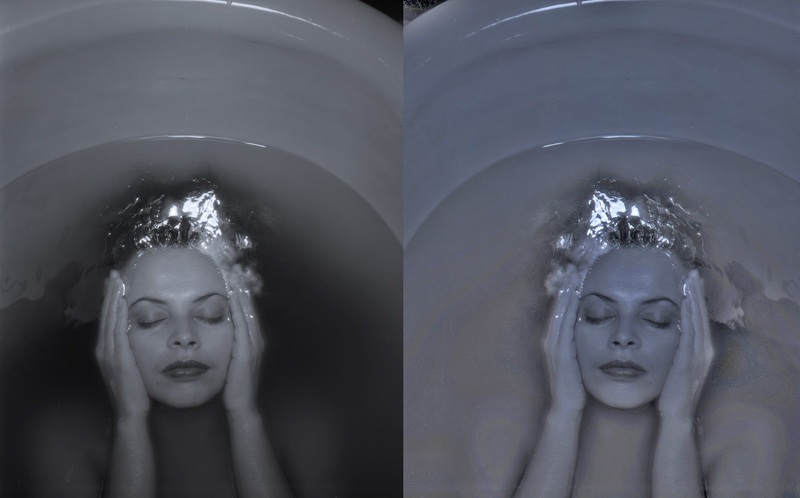 Digital photographers (and consider that by my using a scanner and Photoshop I am pretty well digital) might be able to imitate these effects. But without knowing the effects (the non-digital ones) from the start they would be imitating but not innovating. Sometime in the 60s I read a poetry review in Time Magazine. It was about a world that was suddenly destroyed by a devastating flood of hot water. The almost delightful poem was all about a person having a tub bath and the destroyed world were the bugs (germs, etc?) in the water. Repeated attempts at finding the poem have gotten me nowhere. For a while I suspected it might have been an Auden poem. But I have found none by him in my searches. There is one that does satisfy me and perhaps better accompanies my portrait of Inga Vollmer in her tub.